The Mickey Mouse Rolex is one of this Swiss luxury watch manufacturer's most rare timepieces. Even so, many models are relatively affordable, making them an interesting choice for fans, collectors, and novices alike. There are as many nicknames for Rolex watches as there are grains of sand on a beach. The brand's fans appear to be particularly fond of superheroes, dubbing certain models Hulk or Batman, though they've also come up with more creative monikers like Root Beer. 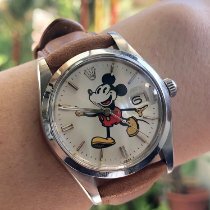 While not a superhero, the Mickey Mouse name refers to several Rolex models, all of which feature this beloved Disney character on their dials. 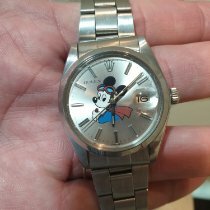 When looking for a Rolex Mickey Mouse, you're likely to first encounter older Datejust models, such as the ref. 1601. However, the Oysterdate Precision ref. 6694 and Oyster Perpetual ref. 6564 also have Mickey Mouse dials. These vintage watches are between 34 and 36 mm in diameter, making them perfect for smaller wrists. At 40 mm, the Submariner, Milgauss, and Daytona are unisex watches with a more masculine size. You'll find Mickey Mouse editions of these timepieces as well; however, their dials are not original. Companies like Bamford Watch Department heavily modify these watches and sometimes give their cases and bracelets a matte black coating. They also get rather imaginative with their modifications. For example, the Bamford x the Rodnik Band watch uses Mickey's arms to indicate the time. How much does a Mickey Mouse Rolex cost? 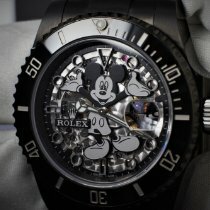 A Mickey Mouse watch can be the perfect entry point into the world of Rolex. Vintage watches from the 60s, 70s, and 80s are particularly affordable, all things considered. You can purchase a Rolex Oyster Precision or Oyster Perpetual for as little as 2,500 USD. These watches are usually in good to very good condition. Plan to spend 1,100 to 2,300 USD more for an Oysterdate Precision with a date display or a Datejust. How much do Daytona, Submariner, and Milgauss Mickey Mouse watches cost? The Daytona, Submariner, and Milgauss have all received the Mickey Mouse treatment in recent years. For example, the watch modifiers at Kustom Swiss Watch (KSW) have created a Submariner Date "Mickey" with a matte black case and bracelet. What's more, you can view the Rolex caliber 3135 through its sapphire glass case back and skeletonized dial. KSW also give the winding rotor a black coating. A smiling, black-and-gray Mickey occupies the middle of the dial. This diving watch demands around 33,000 USD in mint condition, making it some 22,500 USD more expensive than the standard edition. The stainless steel Rolex Daytona ref. 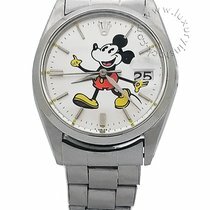 116520 with Mickey Mouse on its dial sells for about 20,500 USD new, about 1,100 USD less than its unmodified counterparts. This is likely because altering a watch often has a negative effect on its price. The Rolex Milgauss Bamford x The Rodnick Band Mickey Mouse is made of stainless steel and available with or without a matte black coating. Small red dots mark the hours on the version with a coating. Both editions feature a sketch of Mickey in the center of their dials. His arms serve as the watch's hour and minute hands. This model costs about 21,500 USD in mint condition. Standard Milgauss watches change hands for around 7,600 USD. 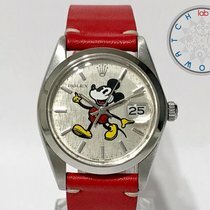 Has Rolex ever produced official Mickey Mouse watches? This question can't be answered with a simple yes or no. Rolex is one of the Swiss watch industry's most secretive companies and is unlikely to ever make a statement in this regard. Whatever the case may be, we do know that Walt Disney regularly wore a Rolex Datejust, albeit without a Mickey Mouse dial. Disney seems to have cultivated a good relationship with Rolex. This is why renowned watch blogs assume that this Genevan manufacturer did in fact release a few entry-level Mickey Mouse watches. Rolex certainly never outfitted top models like the Daytona, Day-Date, or Submariner with this special dial. If you see one of these watches with a Mickey Mouse dial, it was added later by a third party. Most watch modifiers use the original dial, though some turn to their own dials to underscore a watch's unique character. When it comes to older Datejust, Oyster Perpetual, and Oyster Precision models, it's hard to say whether they are completely original or have been modified.